Hard to argue with that but at the end of the day, how you feel about the season really is a matter of perspective. Although the conditions are familiar and obviously the same for everyone –temperatures that range between cold and colder, a healthy amount of snowfall and all the rest – individual reactions vary widely. For many it is the season to throw another log on the fire (or turn up the thermostat) and hunker down with a good book waiting patiently for spring to arrive. For others it is the preferred time of year. Hunters, hardy winter anglers, snowmobilers insist there is no better time or place. Kevin Feenstra, a new contributor to the Riverview, is one who would definitely agree with the more adventurous approach. Kevin is a noted Muskegon River guide and outfitter who spends most winter days on the water with clients in search of Michigan steelhead, one of the most highly revered and legendary fresh water game fish. He has graciously agreed to share his experiences with us. I think you will enjoy his article and his photos that capture the season on the river. We are also pleased to add Garret Jacks PHD, assistant professor at Ferris State University to our list of contributors. Dr. Jacks shares an article on another potential inhabitant of the Muskegon River, the Asian Carp, and how they could play a role in hampering our healthy ecosystem. Two of our regular contributors weigh in as well. You will likely recognize the name Marilyn Keigley in connection with the nature photos she has shared with us in the past. 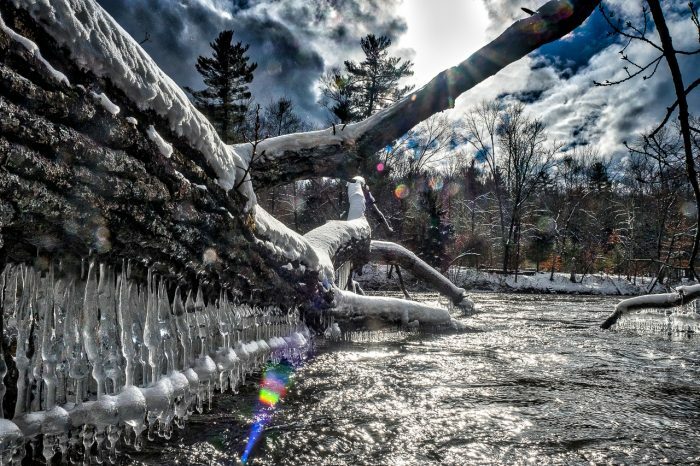 Her article this month offers a unique micro view of winter in Michigan. Rick Lucas, who serves the citizens of Mecosta and Osceola Counties as a forester for the conservation districts, knows more about Michigan forestlands and the value of effective management practices than anyone in the state does. He offers some sound advice in an article that has a valuable nugget of wisdom to match every letter in the alphabet. Finally, the time seems right to share an overview of the most significant work that filled our operational calendar this year. Perhaps most notably, we can characterize 2017 by the wide variety of projects – from reforestation to recycling to rain gardens – which we managed last year. These efforts define the MRWA as an organization and we thought you would want to know.